Congratulations On International Women Day! You are a remarkable, special part of humanity, representing the very essence of nature. You are close to it and therefore make less mistakes than we do. You are more correct. You give life to everyone. A man is born of a woman. He loves a woman. He gives her everything he has (if this is a right man). And a woman represents the entire nature of the world. Today we are still unable to fully appreciate woman’s role in nature. However, we have to keep in mind that this is the entire creation in general. A man is just an auxiliary force, designed to correct this creation slightly by his consequent participation. If he positions himself correctly by switching from the intention for himself to the intention to bestow to a woman, the entire nature will be corrected and will come to its tranquillity. Let’s hope that it will happen if not today. then very soon. I wish you, as well as myself and all the men, great success in this! 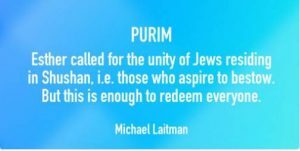 Purim : Haman said the Jews can be destroyed because they’re separated. 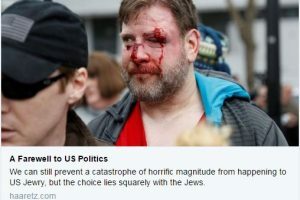 Hostility among American Jews may lead to that result. First people will realize that unity can alleviate suffering & antisemitism. Then— that only Kabbalah (Bnei Baruch) can help achieve it. The unemployed in the US don’t need new jobs. They need to study unity in universal education platforms based on the method of Kabbalah. Lowliness of Kabbalah opponents: being unable to prove Kabbalah teachings as wrong, they miserably try to slander its students. 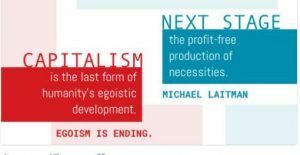 Capitalism is the last form of our egoistic development. What’s next? Jews don’t realize: Antisemitism depends only on their efforts towards world unity – the corrected, future state. It is pushing them! Messiah’s war: when people realize the need to correct their ego, universal hatred will arise towards the method of correction – Kabbalah. Humanity’s history is determined by the Jews, or more precisely by the relationship between Kabbalists and their opponents. Question: What does it mean to write the Torah on the walls of your heart? Answer: The walls of the heart are the most evil, stony desires. That is why it is allegorically written that the Torah has to be written not on the internal, softer part of the heart, but on the external part. To write means that all changes that we have to undergo and that are described in the Torah have to be reflected on our general egoistic desire called “our heart.” In that way, we gradually correct ourselves and the hearts that were at least partly involved in this movement. In the end humanity will realize its egotism and will want to be rid of it. This realization will come as a result of blows, which today begin to fall upon us from all directions. Soon it will dawn on humanity why we have so many problems, why each time we come to a crisis, destruction, disappointment, and hit the wall. Crisis is everywhere: in governments, in families, in absolutely everything. We build and build and see that what we built turns out to be harmful for us. During the last 100 years humanity created so much havoc as never before seen in our history: two world wars, revolutions. Modern world finds itself in such chaos that it is completely incomprehensible what we are supposed to do. Machines are beginning to replace human labor and people are becoming entirely unnecessary. Soon there will be no money, no jobs. That is, the lifestyle will completely change, people will no longer need to work. The realization of evil will come as a result of this, and people will have to understand that life has to flow on a completely different level—within the interactions between people, where all are as one. This is the man’s purpose, the state humanity has to reach. Technology will evolve through the efforts of a few distinct innovators, who will develop high-tech, and all other ordinary people will have nothing to do in this world. They will start to wonder why they were born. At one time, entire life revolved around work: Person worked in order to eat, and ate in order to work. But if today it is possible to eat without working, what are we supposed to live for then? This question comes to everyone: What are we living for? What is point of this life? And it does not have an answer, as if there is nothing to live for. This is how the realization of evil occurs. Question: In what way will the most distant systems will be brought into this process? Answer: There are no near and distant systems. There is only one system, in which we are all interconnected by thousands of connections in such a way that it is impossible to say where is the head and where is the tail. This is an integral, enclosed, circular system, like a sphere. This is why any active process is taking place in the entire system. In every place you can find the head of the system, its body, and its end. It is almost like flowing jello: Each is found everywhere and each element contains the whole, only in a smaller proportion. That is why it is impossible to determine where the head and the tail are in this system. In every place where you find the head, there you will also discover the tail. This is how it happens on the spiritual level. To the degree to which we unite among ourselves through integrated connections, we will begin to reveal the upper force of nature, the Creator. We ourselves need to become integrated in order to reveal the Creator. The Creator exists everywhere, but we have no ability to sense Him, to reveal Him, and even further from us is the possibility to adhere to Him, to be included in to Him. For that we need to correct ourselves, and this is possible only in a group, in a ten. As soon as we reach the first connection in a ten, we immediately reveal the Creator. Because we will already have an integral vessel for His revelation, in accordance with the law of the equivalence of form. Watching The Lessons Or Uniting? Question: There is a good friend in the Japanese group, a loyal friend who studies willingly, participates in the group work, but doesn’t want to watch the lessons together with anyone claiming that he cannot absorb the material well when he is with others. Why is it important to watch the lessons together according to the wisdom of Kabbalah? Answer: The point is not whether you watch the lessons together or by yourself, but whether you unite or not. Perhaps the group is still very young, people have different mentalities, etc., gradually you will begin to hear and see more and more and then you will feel that there is no other way to fulfill the wisdom of Kabbalah but by overcoming the ego and it is possible to overcome it only by mutual actions. Question: Are there forms of life in the universe other than the material world? What does Kabbalah say about this? 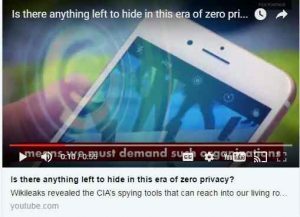 Answer: You can stop searching! There are no other forms of life in the entire universe. We are unique in this small world. All we must do is unite as quickly as possible until we reach the minimal spiritual level in order to ascend to the next dimension. When a person ascends to the next dimension, the entire universe disappears and fades away, and he enters the world of forces, leaving the world of matter. Torah, Deuteronomy 19:21: You shall not have pity: life for life, eye for eye, tooth for tooth, hand for hand, foot for foot. A person must destroy the enemies, meaning his egoistic desires, that he has to correct with the help of the Upper Light, either to the desire to bestow or to the action of bestowal. There can be no concessions. Each one must completely remake his egoism, while clearly, really feeling it in himself and applying a maximum amount of effort to it. A person shouldn’t take into account his egoistic weaknesses. It is written, “life for life, eye for eye.” It means that you have to turn all the desires into the opposite ones and gain spiritual life instead of the egoistic one. However, it doesn’t mean that you separate from it, it just moves into a different phase, for the sake of a different ideal. Yet, you continue to exist in the material world. Most people think that they are obliged to die and disappear from this life. It isn’t so! It is written, “You shall see your world during your lifetime in this world.” After all, we need to add to the sense of the material world, the sense of the upper world. Question: Why it is written “life for life, eye for eye, tooth for tooth, hand for hand, foot for foot”? Why exactly are these parts mentioned? Answer: Because these are the most important parts of the spiritual Partzuf called soul. The soul is divided into three parts: head, body, and limbs. Each of them has its parts. The head portion is located in every organ of the body and vice versa, each organ of the body is connected to the head part. The eye is an organ through which you see, investigate, exist, and attain. Teeth are like millstones that grind all the data that comes to you, all your desires. A hand is also an attainment, just on the different level than an eye. And a foot symbolizes movement forward. These are the most important parts of our soul that has the same structure as a physical body. Question: Can we can count on the fact that the Torah we are reading today is authentic? Isn’t it distorted by different translations and publications? Who wrote it? Was it written by certain authors? Answer: There is no argument about that. Everything is absolutely accurate. Even Kabbalists who attain the upper world today see that the Torah describes the structures and the mutual cooperation of all of the elements in the upper world, which means the systems that manage us and all of creation, including the upper one. The Torah is not about people, about historical events, or geographical locations, but only about the interaction between the elements of the upper forces that eventually depict and present on our internal screens a kind of an existence that drives a person toward correction. The Torah tells us how the absolute and eternal system—which includes the beginning and the end of the whole of creation—is arranged, and tells us about how we develop inside of it from the beginning of creation to its end. There cannot be any additions or anything that is redundant in these descriptions. It always exists the way that it is. In every generation, Kabbalists who study the Torah go over it again and again, and discover to what degree this system is absolute. The Torah was written by Moses during the forty years of wandering in the Sinai Desert. After the construction of the two Temples, Kabbalists came along who wrote books on a different level, a lower one that was adapted to the conditions in their generation. In their books, they conveyed the states they attained. Thus, during the time of the First Temple, the book of Prophets was written, and closer to the time of the Second Temple, Holy Scriptures (Ktuvim) were written, but they do not nullify the Torah in any way. It is a law, and it remains above all other books. Its practical uses with regard to the lower level were actually presented by the explanations in the Prophets and Scriptures. Together, they are called the Tanakh (Torah, Prophets, and Scriptures) and were written from a very high level of attainment from the complete knowledge of the system. This is the reason that everything that is said about them is absolutely accurate and has proven to be correct for thousands of years.